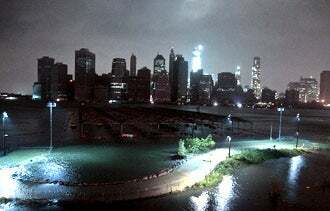 In the aftermath of what New York City mayor Michael Bloomberg has called potentially "the worst storm that [the city has] ever experienced," entrepreneurs across the Big Apple have experienced varying degrees of success keeping their doors open and their businesses online in the wake of Hurricane Sandy. With high winds and rain, Sandy battered the East Coast on Monday. Businesses in low-lying areas were hit the hardest due to severe flooding. New York City-based online businesses -- including news sites like Gawker and Mediaite -- were knocked offline after a data center went down during the storm. "Small businesses have suffered," New York governor Andrew Cuomo said at a press conference Tuesday morning. But as entrepreneurs tend to do, owners are finding creative ways to get back to business after the storm. When power went out at the west 14th Street offices of Onswipe -- a platform for creating touch-enabled content -- the managers headed to a hotel in midtown Manhattan where they had access to electricity and Wi-Fi. "Safety matters a ton, but we're not letting anything, even the forces of nature, slow Onswipe down," co-founder and CEO Jason Baptiste said in an email to Entrepreneur.com. Another startup called Shuttlecloud barely missed a beat after losing power at its office on Chambers Street in lower Manhattan's Tribeca neighborhood. A provider of cloud-based data migration software, Shuttlecloud is almost completely run in the cloud, so its employees have been able to keep business going remotely. "It's not as good as in-person collaboration, but we have been working together using Google Hangouts," co-founder Eduardo Fernández said in an email. "Ten years ago, before the advent of cloud-based services, this would be a very different story." In nearby Brooklyn, businesses in the Park Slope neighborhood opened their doors to give area residents a place to congregate and share Sandy stories. Anna Decanio, a co-owner of Bagel Market, drove and personally picked up employees to bring them to work on Tuesday. Because Bagel Market is located on higher ground, the store didn't suffer damage or lose electricity. And the decision to open shop turned out to be a profitable one. "We are actually very busy," Decanio said Tuesday. "Everybody is home because they couldn't take the trains," which were shut down city-wide on Monday night. Park Slope's Southside Coffee also benefitted from locals who stayed home from work. But for store owner Ben Jones, making sure conditions are safe for employees and customers is a priority. "The advantage of being a local business is that you have people that live nearby," said Jones. "That is really where you are making your judgment calls -- you don't want to be putting people in a position they are not safe." Do you have a disaster recovery story of your own? Share it with us in the comments below.